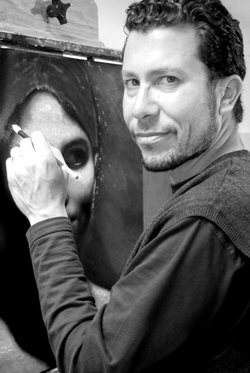 I am a Santa Fe-based artist of Latino background who has developed a career exhibiting both in the US and Europe. Being exposed to theater as a child (my parents had a very successful flamenco dance troupe) and to the sensibilities of my Spanish father, I began painting emulating the great Spanish masters such as Goya and Velázquez. I later discovered Caravaggio and the work his followers--my first body of paintings had distinct tenebrist sensibilities, which highlighted the luminosity of the flesh and psychology of the characters in theater-like settings. I then became fascinated with the Fayum portraits, and for a number of years did a great deal of research on the ancient methods of the Greek and Egyptian painters. I learned how to use the heated wax technique of encaustic to paint portraits. I then created various bodies of work centered on contemporary portraits of people using an ancient method and approach. I lately developed a project called, “Doña Inés Lost Her Slipper”, which was inspired my own family history of growing up in a multi-ethnic household of Europeans and Native Americans. It is a project centered on the fictional story of a Spanish aristocrat who travels to the New World and is presented with a Native American maidservant. I ran a successful kickstarter campaign for it, and it was exhibited at Santa Fe’s premier space for alternative art projects—the Santa Fe Community College Visual Arts Gallery, with much press interest. It then traveled during the summer of 2015 to the Palazzo Nicolaci in Noto, Sicily. A catalog was produced in conjunction with the show. The main themes in my work are a focus on the recuperation of Old Master techniques and approaches, with a heightened awareness of contemporary art. I enjoy juxtaposing art styles from various periods to highlight the political contexts, gender roles, and psychological realities of the various human subjects I paint. I use historical pigments and materials to excavate the past, and make statements about our own place in history at this time of upheaval and inexorable change.